I have a bit of a disclaimer to kick off this post. I won’t always have the time to write an individual post about everyone that I’m interviewing for my historical Brewers book – mostly because I have to keep writing the actual book! The book is a separate entity, and will include some interview quotes that I share in the blog posts, but will be written and presented in a different manner. The blog posts are mainly meant to give you a little background on the people in the book. With that out of the way, let me tell you a bit about Ted Kubiak and his time in a Milwaukee Brewers uniform. I contacted Ted earlier in the summer, and he didn’t respond until recently with well thought responses to my questions. Ted grew up in New Jersey and loved all sports, but baseball emerged as a favorite in high school. He played shortstop on the high school team and was named MVP during senior year. Ted was then invited to a tryout camp for the Kansas City Athletics (A’s), and wound up being offered a spot in their minor league system on the second day of camp. This included a signing bonus of $500. Ted did have plans to attend college and become an architect. He has said in interviews that his parents let him decide which path to choose. He thought a baseball career was “such a strange opportunity to be given” that it was the clear choice. Admittedly he does have some regrets about not returning to college. Ted was never known as a great hitter and has mentioned this fact in many interviews. One thing he did to make himself more valuable at the plate was working to become a switch hitter after the 1962 season. He credits this with keeping his career moving forward, and by 1967 he was with the Kansas City Athletics. 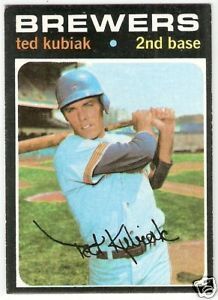 Ted Kubiak was a major leaguer at the age of 25, and would never see the minor leagues again until his post-playing career as a coach. While he wasn’t an everyday player, Ted’s work ethic and willingness to learn and take on new challenges served him well. He started filling in at second base and third base even though his natural position was shortstop. A young Sal Bando was on the team, and of course Brewers fans remember him from his later years with the team as a player and General Manager. In 1968 the A’s moved from Kansas City to Oakland. Ted continued in a reserve role, and seemed to get the most playing time when starters were injured or in a slump. He played the most innings (363) and had the most at bats (305) during his time with the A’s in 1969. He also hit his first career home run that year. As things were starting to turn the corner, Ted was traded with pitcher George Lauzerique to the Seattle Pilots for Ray Oyler and Diego Segui. He never played a major league inning with the Pilots as they moved to Milwaukee from Seattle just before the 1970 season opener – but that’s another story! Ted went 0-3 that day at the plate, striking out once and drawing a walk. A lot of trips to the plate were in his future, as he wound up playing in 158 games. He was utilized by manager Dave Bristol at second base and shortstop. His batting average improved to a career high .252 that year, while he drove in 41 runs. Ted has a great background in writing from his long coaching career. 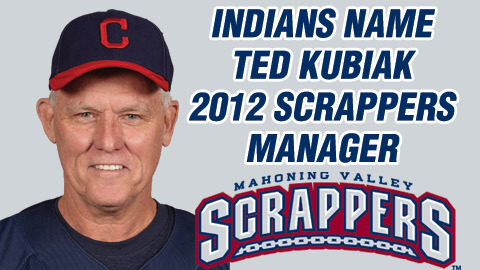 He was the minor-league defensive coordinator for the Indians from 2004-2008. During that time he wrote an infield manual that consisted of 300 pages, and had many great tips and wisdom. I’m looking forward to reading his book and will do my best to keep you updated as to when it becomes available.